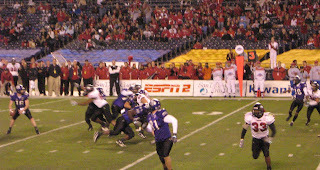 Sure looks like the eagerly awaited San Diego County Credit Union Poinsettia Bowl was bursting to the rims with fans. I heard that scalpers outside were selling tickets with prices up to $8 dollars. Watched the Memphis play Georgetown last week and, boy, they look for real. In the jerk comment of the week, we have Jets WR Laveranues Coles, of the 3-12 Jets. See, Laveranues feels when his team has 3 wins out of 15 is a good time to demand a raise, especially considering he's amassed a whopping 55 catches over those 15 games. And gosh darn it, $5 million just isn't enough. And to persuade people Laveranues has said, "It's not only me I have to keep in mind, I have a family also," he said. Yeeeaaaahh, 5 million just won't be enough. I know the new Tigers stadium is huge, but I'm concerned about Dontrelle Willis facing AL hitters. In a spacious park down in Miami, facing NL hitters without a DH, Dontrelle's stats in every category have gone down. Of most concern, the base on balls. After only giving up 55 in 236 innings in 2005, he gave up 87 in only 205 last year. Watched a bit of the Heat game on Christmas and wowzers, it is waaaaay past Shaq's warranty date. In the ANDAPLAYERTOBENAMEDLATER's Man of the Week, we have a tie. Ahmad Bradshaw and Brandon Jacobs of the Giants. Together they combined for just shy of 300 yards against the Bills. Bradshaw, who has come from Whoville to play for the Giants, ran for 151 yards on 17 carries and Jacobs ran 24 times for 145 yards. All this got the Giants past Buffalo, on a helllstorm day up in Orchard Park and the Giants into the playoffs. And lastly, would somebody please, please assasinate Bill Walton so he's never use the phrase "premier player in the NBA" ever again. I am always amazed at how cheap you can get tickets to bowl games if you wait long enough. I went to the Sugar Bowl one year, and I was able to get tickets for well below face value. Not 8 bucks, but still pretty cheap. 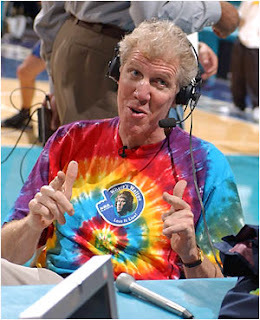 Bill Walton does need to go. He's not interesting at all and he's incredibly annoying. I think he should coach in the WNBA.